The Maine State House is seen in this January 2016 photo. 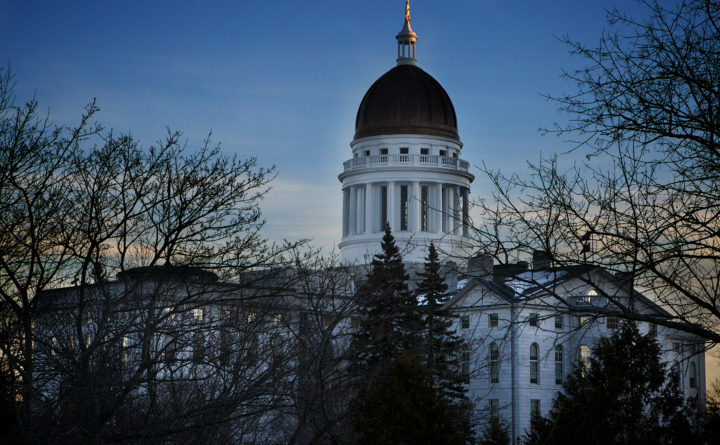 Maine made history with the election of Janet Mills as the state’s first woman governor, and more women will serve in the Maine Legislature than ever before: 72 compared with 64 last year. While that’s well short of half of all seats at the State House, women on both sides of the aisle say they’re excited about having more seats at the table and what it could mean. In rural Lincoln County, 26-year-old activist Chloe Maxmin, who helped organize the fossil fuel divestiture movement as a college student at Harvard, did something unusual for a Democrat in District 88: she knocked on nearly 10,000 doors over the past nine months, and she won a House seat that had been held by a Republican for the past eight years. She says the experience left her with a key takeaway. Maxmin said people are eager for new energy and ideas about how to make politics more responsive to people who feel marginalized back home. Republican Josanne Dolloff of Rumford has similar thoughts about her victory in Rumford on Tuesday night. Dolloff, who had served on the school board, never thought about running for higher office, but she was recruited in July and beat an incumbent Democrat on her first try. “I’ve always stood beside my neighbors, and when I was on the school board I always fought for those kids, fought for the teachers, and I think people around knew me as that, that I will stand up, I will ask the questions, I will get answers and I will work hard,” Dolloff said. Like Maxmin, Dolloff said she’s committed to representing all the people of her district, irrespective of party. If that sounds like a different kind of message against a backdrop of highly charged political rhetoric, former Democratic House Minority Leader Emily Cain said there’s a reason. Cain now serves as executive director of EMILY’s List, not named for her, a political action committee that helps elect pro-choice women to office. Other than having fewer Republican women in the U.S. House, which Cain said is disappointing, she’s thrilled with the way things are going: 23 new Democratic women elected to the U.S. House, including the first Native American women, the first Muslim women, the first Latinas from Texas and the first women of color ever to serve in New England’s congressional delegation. The 2016 presidential election of Donald Trump spurred many women to seek political office, Sarah Skillin Woodard of Emerge Maine said. “I know we’ve seen our applications go through the roof,” Woodard said. Emerge Maine recruits, trains and supports Democratic women to run for office. This year 19 of the 25 Emerge legislative candidates won their seats. Woodard said that as more women think about running and get elected, there could be some other big changes at the State House and beyond. “Having more women in the Legislature may very well mean a shift in focus toward affordable health care, affordable and quality child care, family leave laws, environmental protection and, really, the overall the protection of our most vulnerable while ensuring the stability of our economy,” Woodard said. Cain said the ultimate goal is for women to make up at least half of the elected officials in the country and to be representative of the nation in its entirety. She and others see the wins Tuesday night as a leap in that direction.